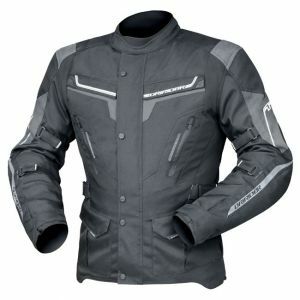 Compare motorcycle jackets from Alpinestars, BMW, DriRider, Harley-Davidson and Triumph on factors including comfort and fit, protection, style, durability, functionality, value for money and overall customer satisfaction. Returning to the winner’s circle, DriRider has topped Canstar Blue’s customer ratings for motorcycle jackets for the third time in four years, with five-stars for protection, durability, functionality, value for money and overall satisfaction. You’ve got your dream bike, and now you need all the accessories to go along with it. The costs certainly add up quickly, so you might be tempted to take a cheap option when it comes to your jacket. But that’s not necessarily a smart move. In addition to keeping you safe if you happen to come off your bike, good motorcycle jackets can make riding in miserable weather a little more enjoyable, as well as look and feel great to wear. 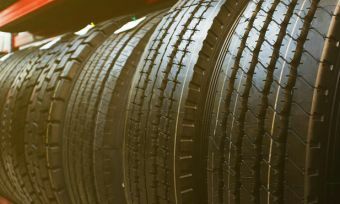 Ultimately, it’s important that you feel comfortable on the road, especially when it comes to long and tiring journeys. But when it comes to finding a jacket that suits your ride, as well as your wardrobe, riders have plenty to pick from, making it a difficult decision to make. Taking your time when you’re trying on jackets can help ensure you find the right fit for you and your riding preferences. 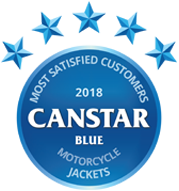 To help you sort through the wardrobe, Canstar Blue produces an annual review for motorcycle jackets, rated by Aussie motorcycle riders based on their everyday experiences. Last year, Harley-Davidson was rated highest, but in 2018 DriRider is back on top of the pile. That makes it three years out of four for the Aussie brand – a great indicator that it’s keeping local riders looking and feeling good on their bikes. 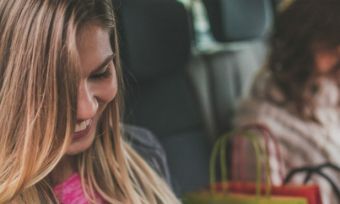 The survey found that comfort & fit, protection, and style are the greatest drivers of overall satisfaction for consumers, with functionality and value for money considered less important. That’s worth keeping in mind the next time you’re tempted just to buy the cheapest jacket possible. 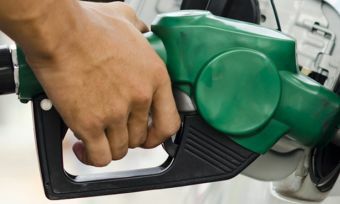 Regardless of their reason, survey respondents spent over $400 at the checkout on their jacket of choice, which may prove to be a small price to pay for peace of mind and safety while you’re out on the road. A popular option for many riders, Australian brand DriRider offers plenty of protective gear for your rides, whether you’re commuting to work or adventuring off-road. Being an Australian company means DriRider has you covered against the local elements, with plenty of jackets coming with waterproofing, as well as thermal liners for when those cool breezes roll through. Priced between $90 and $500, DriRider has plenty of jacket options, regardless of whether you’re looking to spend big or stick to a budget. If you’re looking for a road jacket, the Apex series might be worth a look, whether you ride around town or like to get away on long road trips. Including a Maxtex polyester outer shell with shoulder and elbow padding, as well as a Hi-Density back pad, the Apex series is available in a variety of colours to suit your bike or style preferences. For those big on off-roading adventures or Motocross, the Rallycross range could be the best fit for you, with an abrasion resistant exoskeleton with rip-resistant mesh panels for extra protection if you fly off the handlebars. Additional features include zip-off sleeves for those hot days, as well as rear storage pockets and hand warmers for extra comfort on those longer rides. For everything else in between, DriRider offers jackets such as the Climate Control range, for those who enjoy long trips, while those more likely to ride in the city might be better-suited with the Nordic range, which includes reflective printing for night time visibility, in addition to a tailored fit and plenty of pockets. If you’re looking to make a statement on your ride, jackets like the denim-styled Memphis and the leather Phoenix jacket may be the option for you, both on and off your motorcycle. 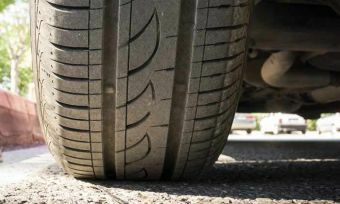 In addition to a five-star rating for overall satisfaction, DriRider was rated five stars for protection, durability, functionality and value for money, with four stars for the remaining categories. 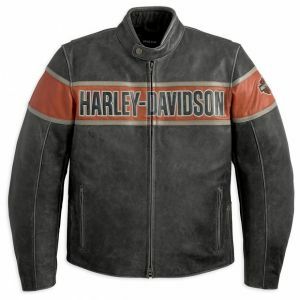 A fashion statement as much as it is a respected brand, Harley-Davidson provides a number of casual and riding jackets for consumers to choose from, whether you want to look good while on the road or strolling down the pavement. While one of the more expensive options on the market – with most jackets priced between $400 and over $1,000 – Harley-Davidson may be a worthwhile option if price isn’t a problem, or you’re going for the full Harley aesthetic. Split between leather and mesh options, Harley-Davidson jackets contain body armour pockets primarily on the elbows and shoulders, with additional padding on the lower back. Most will also include adjustable waist tabs and multiple pockets for extra comfort and convenience, with additional night-time visibility patches for increased safety. The top-of-the-line leather jackets contain a removable full-sleeve waterproof liner, as well as thermal reflective technology for long rides in the hot sun. Some jackets, such as the Auroral range, additionally include a removable hoodie, making it ideal for when you’re off your bike, or just riding in cold weather. Regardless if you’re looking to impress while cruising on your bike or out on the town, Harley-Davidson has plenty to offer the style-conscious consumer. The only brand to earn a five-star rating for style, Harley-Davidson also got five stars for durability, with four stars in all remaining categories, including protection and overall satisfaction. Well-known within the racing community, Italian manufacturer Alpinestars has plenty of options for those looking to break lap times, as well as those who just enjoy a Sunday afternoon ride. Priced up to $1,000 for riding jackets, Alpinestars may be one of the pricier options, but may be well worth the money if you’re looking to get out on the racetrack. For those wanting a bit more than a jacket, Alpinestars also offers racing suits, ideal for those looking to set a new lap record. While they will set you back between $999 and $1,999, each suit covers riders from shins to shoulders, with dynamic friction shields to keep you safe should you end up closer to the bitumen than you would like. Each suit also features pre-curved sleeves for additional comfort while you’re on your bike, with removable mesh liner for breathability. If you’re looking for a stylish option, Alpinestars offers plenty of options under its Urban range, with prices ranging between $75 and $800. It includes simple rain coats all the way through to full leather jackets. 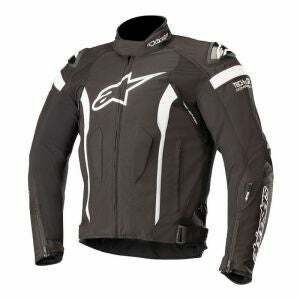 Rated four stars for overall satisfaction, Alpinestars also scored four stars for protection, durability and functionality, with three stars for comfort & fit, style and value for money. 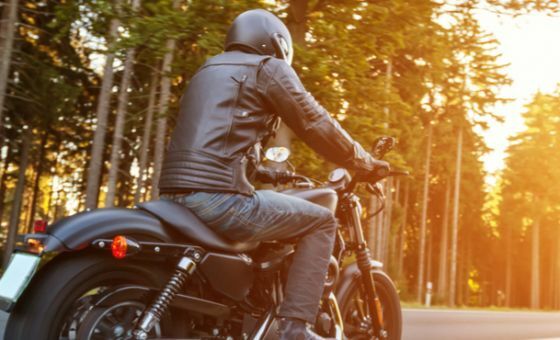 A popular British manufacturer, Triumph may be the brand of choice for you if you’re looking for a leather motorcycle jacket, although you may have to look elsewhere if you do the majority of your riding off-road, with the brand sticking to on-road jackets. Reasonably priced within the market, most of Triumph’s range will set you back between $300 and $800 depending on your local retailer. Riders are treated to options such as the full leather Beachley jacket, which contains zip ventilation and a removable vest liner, in addition to multiple pockets for your phone and wallet. There is also the vintage-styled Raven range, which offers multiple styles to suit your wardrobe and bike. Raven jackets come with removable shoulder, elbow and back protectors, with an additional AirFlow zip ventilation feature to help keep you cool. Other options include the Beaufort, Taloc and Mono jackets, each offering riders a variety of protective features to keep you safe on your motorcycle, while also offering plenty of features for added comfort for when you’re on two wheels or on foot. The only brand to score five stars for comfort & fit, Triumph additionally achieved five stars for durability, with a four-star rating in all remaining categories, including value for money and overall satisfaction. 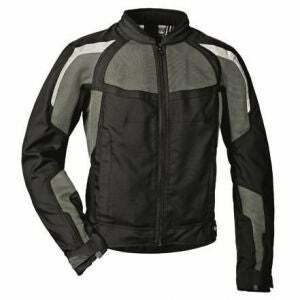 Luxury bike brand BMW offers a number of motorcycle jackets with plenty of protection and features for comfort. Offering jackets for on-road riders, off-road adventurers might have to look elsewhere for their protective needs. One of the more expensive options, BMW’s jackets will set you back around $600-$900 depending on the retailer and jacket, so be sure to shop around. Those looking for a jacket for their morning commute may find the StreetGuard and Street Air lines to be appropriate, each coming with airbag technology protection in case of an accident, plus removable elbows and shoulders for increased comfort. Other features include waterproofing for when the weather turns nasty, as well as ventilation zips and pockets for easy use. For those looking to get away for the weekend, or just enjoy longer rides, BMW offers the Venture Neon, Tokyo and Race jackets, each suited for those who spend more time on their bike than off it. These are made from different materials such as mesh or leather to better suit the Aussie weather, with reflective print to keep you safe on night time rides. For those looking for something to wear out on the town, BMW has got you covered. Jackets include the Downtown, San Diego and the Club Leather ranges, all available in different styles and colours to suit the rest of your wardrobe. Each range includes removable protective gear for if you decide you want to look stylish while on your bike, with handy pockets to keep your phone and wallet safe. Rounding out the results, BMW was rated three stars across all categories, including comfort & fit, durability, value for money and overall satisfaction. 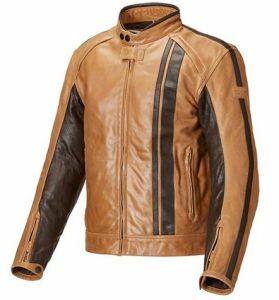 Which motorcycle jacket should I buy? Motorcycle jackets are a handy piece of gear, able to keep you safe and warm while on those long rides, as well as spruce up your wardrobe if you’re looking to make a good first impression. But when it comes to finding the best fit, riders have plenty of options to choose from, which can make it a difficult decision, particularly if you’re a first-time rider and jacket-wearer. Ultimately, it will come down to your personal preferences, as well as your circumstances. If you do most of your riding off-road, then a fully protective motocross jacket may prove to be your best option, while a jacket with plenty of ventilation may prove better for those who do most of the riding in the hot sun. To ensure you ride off with the best fit, it’s best to do your research, as trying on a few jackets and looking into what brands have to offer will help ensure that you’re not only protected, but kept comfortable while enjoying the ride. Canstar Blue commissioned I-view to survey 900 Australian motorcycle riders across a range of categories to measure and track customer satisfaction. The outcomes reported are the results from customers within the survey group who have purchased and used a motorcycle jacket in the last three years – in this case, 429 people.